Hyderabad: Senior YSR Congress Party (YSRCP) leader Samineni Udayabhanu questioned Vangaveeti Radha's decision to leave the YSRC Party and join the Telugu Desam Party (TDP), the same party which was responsible for the murder of his father Vangaveeti Mohan Ranga. Speaking to reporters at the Party Head office, he said that the parting comments made by Radha on the YSRCP and its leader YS Jagan Mohan Reddy were disgraceful and painful. He also questioned as to how he could even have discussions with the TDP, when his father Ranga had such good relations with the party and also when YSRCP leader late Dr YS Rajasekhara Reddy supported him through thick and thin to climb up the political circles. But the TDP leaders snuffed out his political career midway by brutally murdering Ranga in broad day light, he recalled. Udayabhanu also reminded him that that it was at Chandrababu's behest, Kodela Sivaprasada Rao ( who was the home minister then) along with the support of Devineni Nehru, Velagapudi Ramakrishna Prasad and other TDP leaders, were the main perpetrators' of his father's murder. This was also mentioned in the autobiography of senior leader C Harirama Jogaiah, he reminded him. Now Radha's claims that his father was killed by "some people" and not the TDP is hurting his father's followers who know the truth he said. Radha is parroting these statements scripted by the TDP and also said that YS Jagan Mohan Reddy had treated Radha like a younger brother and had given him the post of President of the YSRCP Youth Wing after 2014 elections. YS Jagan also made him the State Secretary and the YSRCP Vijaywada Party President.But Radha never participated nor conducted any of the official meetings nor did he do anything when the party was fighting for the special status. But to say that YS Jagan had not given him any importance or role in the party is absolutely incorrect and that the people of Vijayawada were laughing at his blatant lies, he said. 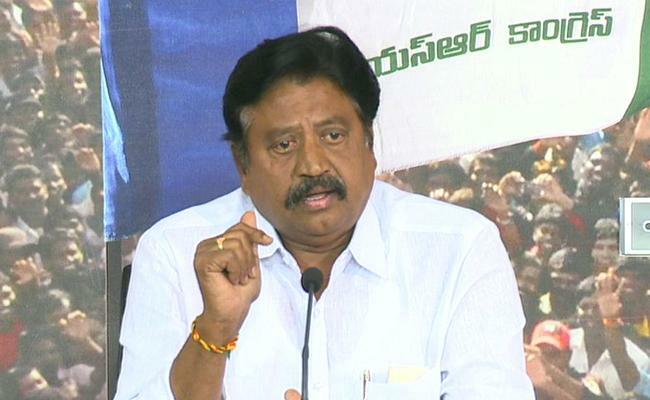 Samineni Udayabhanu also clarified that YS Jagan Mohan Reddy never objected to Ranga's statue being erected in Vijayawada and in fact, he gave utmost importance to Radha among other leaders in the Krishna district ,he said. He also reminded that him that it was YS Jagan Mohan Reddy who garlanded his father statue when he had joined the YRSCP in 2012. When Radha objected to Devineni Nehru joining the party, YS Jagan respected his word as he was Vangaveeti's Ranga's son and did not let him into the party. What could be more blasphemous than Radha accusing YS Jagan and the party of these lies despite giving him and his family so much respect, Udayabhanu said. It was clear that Radha has fallen for the TDP's words and it would be better if he had any conscience left, he would know that all what he was saying was absolutely false. Joining the TDP is nothing but a shameless act on Vangaveeti Radha's part , he concluded.